“You never change things by fighting the existing reality. To change something, build a new model that makes the existing model obsolete.” ~Buckminster Fuller. Apple has announced that smart speaker HomePod will not be available in the market till 2018. Apple announced the release of Smart Speakers, HomePod in WWDC on June 5, 2017. Apple said that HomePod would make an entry in the market by the end of 2017 and you can get it for $349. However, with the latest announcement of the delay, the users will have to wait till next year. HomePod is cylindrical in shape and has a seven-speaker array of tweeters, a six-microphone array, a four-inch subwoofer which makes it a demandable home speaker. All these things have put it right on to the list of the best Product in its category. It is said that the issues with Siri, the digital assistant, is causing the delay. WHAT APPLE HAD TO SAY ABOUT IT? Apple stated, “We can’t wait for people to experience HomePod, Apple’s breakthrough wireless speaker for the home, but we need a little more time before it’s ready for our customers. We’ll start shipping in the US, UK, and Australia in early 2018.” The speaker was said to be released in December 2017 originally. The HomePod is said to be a rising competitor for higher-end sound systems like Sonos, as well as smart assistants such as Amazon Echo and Google Home. With the delay, it seems that Apple is working on bring on its A game to make itself unbeatable in smart speaker industry. 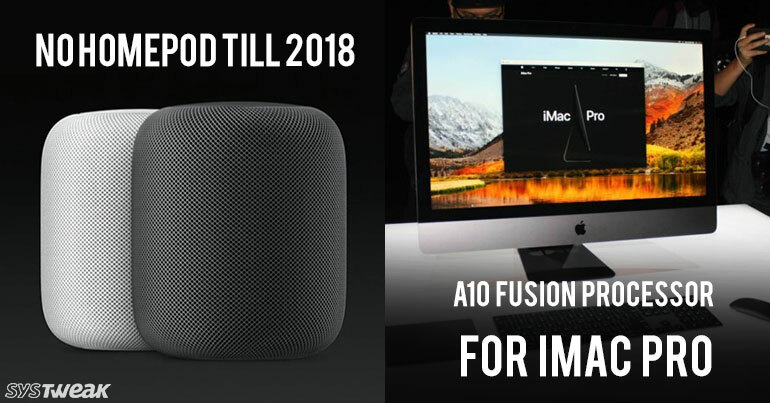 iMac Pro is about to launch by the end of this year and it will have ARM core processor in the form of an A10 Fusion chip. Many of the people were eagerly waiting for the Apple Products that were about to launch in December 2017. With the announcement of the delay of HomePod, all the eyes are now iMac Pro. Apple announced it in WWDC in June 2017 and quoted it as the most powerful Mac. The iMac Pro will come with 8-core, 10-core and up to 18-core Xeon CPU configurations. BridgeOS 2.0 software package is said to be appearing on iMac Pro. Developers Jonathan Levin, Steve Troughton-Smith, and Guilherme Rambo checked the software package and told that it appears to be the version of the same processor as of iPhone 7 – A10 Fusion Chip. It will be used as a separate processor in the upcoming exclusive desktop. Troughton Smith also mentioned in a post that ARM-based chip is said to be responsible for security Processes and Mac OS boot which will enable Apple to “experiment with tighter control” on MacOS without making the user uncomfortable. Well Hey Siri has made its way to desktop and laptop with the launch of macOS Sierra in 2016, but now in iMac Pro, the feature will be upgraded to ‘always-on’. Guilherme Rambo discovered the fact. This means the A-10 chip would run constantly even if your computer is turned off, which means, you will be able to give Commands to Siri even the iMac Pro is asleep. With all these new disclosures, people would be more than exhilarated and will wait for the launch with more enthusiasm. WAS APPLE KEEPING IT A SECRET? Apple has missed mentioning about any tremendous changes in iMac Pro processor. It just disclosed the base configuration would cost $5000. Looks like, Apple wanted it to be a surprise. However, to its dismay, some of the iOS developers revealed the big news about the upcoming high-end Product, iMac Pro. Now, people are excited to know what all Apple has not unveiled yet. With all these features added, looks like Apple is doing its best to bridge the gap between computer and smartphones but FaceID has still not made its way to iMac Pro.